The best voice teachers know that teaching technique is like trying to hit a moving target. There are many different aspects of a singers voice that must be balanced in order to reach ones full potential, and no two students are alike. This, to me, is why some voice teachers are wildly successful with certain students, and almost completely ineffective for others… most instructors teach their students they way they were taught. But the thing is, singing can’t be taught that way. We all have different vocal habits that we’ve had for years, and I guarantee your habits are different than the person next to you. It’s not like piano where we all start with middle C.
All that being said, there are a handful of different things that have to be in place in order to achieve vocal balance. These are principles that, if balanced properly, will help every singer across the board, it doesn’t matter what your habits are. But, it may help to think of these factors as sliding faders on a mixer instead of switches that are on or off. The breath is the fuel of the voice, so it is important that we have good support. The reason we breathe from the diaphragm is to create a steady flow of air. This can be a lighter flow that’s more released, or we can sing with a little bit of compression and have a heavier sound. However, too much compression will close off the sound, so balance is imperative. Cord closure, or vocal edge is also required for balancing the voice. If you are supporting well and have good cord closure, you’ll be able to sing forever. If you lack cord closure, you’ll have a breathy tone and will struggle to sing through a single phrase. Like anything else, cord closure can be taken too far. Too much and you’re creating unneeded pressure in the voice… too little and you’re breathy. Balance is key. Having a solid chest voice is imperative for good, healthy singing. Finding chest voice is simple for most singers because most people talk in their chest voice (Julia Childs being the exception). But, chest voice can only go up so high before it’s forced and creates vocal issues. So, it’s important for a singer to consciously or unconsciously learn to mix the voice as to take unneeded pressure off and allow the voice to stay full as they ascend in pitch. Head voice is another important part of the voice to develop. Without head voice, you can’t really mix. Most people think more choir or opera singing while using head voice, but this isn’t always the case. We’re hearing more and more head voice on the radio today, and of course, one must have a healthy head voice before they can consistently sing in a mix voice (mix voice being a mixture of head and chest voice). Pharyngeal is one of a handful of different ways we can find mix in the voice. Pharyngeal is a very forward sound that slaps the listener in the face, but is completely released. This is an important part of the voice to find as it’ll release your voice tremendously, but some tend to struggle with it, naturally wanting to sing it with way too much tension. If you want to sound good, and you want to sing tension free, you must have a balanced larynx. If the larynx (voice box) rises or falls too much while singing, you’re going to create unneeded tension, leading to the voice cracking, or just being shut off all together. 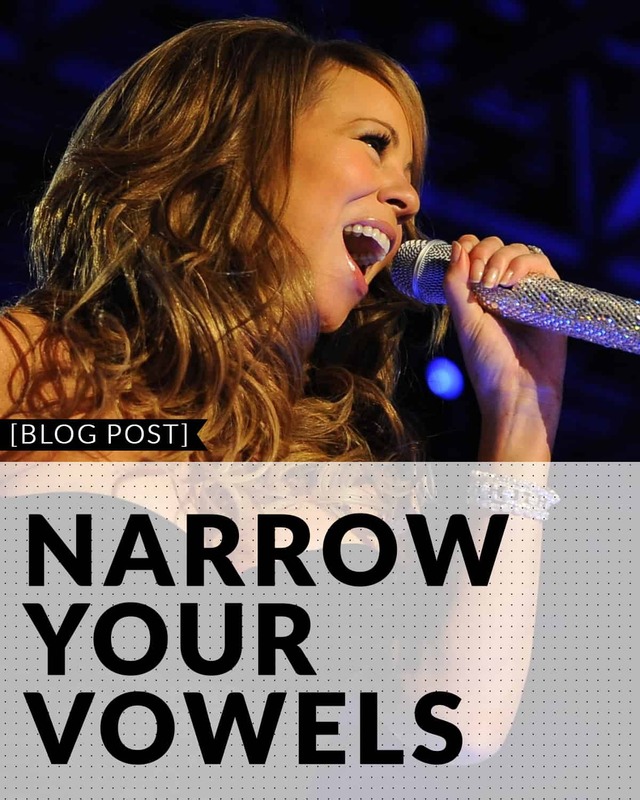 As a general rule, as singers go higher, their larynx wants to rise as well. Balancing the larynx is probably one of the more essential things to do while teaching, and a very necessary element to helping a singer balance their voice. If there’s one thing I know, it’s this… if you’re singing with tension, you’re dramatically reducing your abilities as a singer. It’s really common for singers to engage either their digastric muscle (located under the chin… basically the bottom of the tongue) or other swallowing muscles (muscles located in the neck around the voice box) while singing. Doing this hinders the voices ability to let go, and is responsible for reduced stamina, discomfort, and limited range. Releasing these muscles greatly increases a singers abilities all the way around. All singers have different ways that they can improve their voice, and sometimes what they need to work on one month might be the exact opposite of what they work on the next. Balancing all of the above elements of singing is like trying to consistently hit a moving target, but there is hope, and we find it in a little something called habit. Fortunately for us, our voice wants to be free and relaxed. When we find that freedom, it wants to return to that. Does this mean that once a singer finds release, they’ll never have to work on their voice again? Unfortunately no. We have way too many years of habit in place for that to happen. But, every time we find release… every time we achieve a greater balance… our voice started to develop a recognition for that and starts creating habit in that direction. So really, our goal as singers should be to find balance enough and practice balance enough that it becomes second nature. The more you do this, the more your voice will blossom into it’s full potential. I hope this helps. It was certainly a much longer article than I anticipated, but I feel like it’s a good feel for how an instructor should handle technique (though a talented instructor should be able to trick a student into doing all of this). Regardless, I hope this sheds some light on how one balances their voice. ps – Interested in learning more? I teach one-on-one lessons out of my home studio in Orlando, and video skype. Check out LessonsWithKen.com for details.